NO INFORM POETS THIS WEEK! Summertime can be entertaining, and we find ways to entertain ourselves at our leisure. We watch movies, films and watch programs. We listen to music and read books. Some continue to write poetry… we occupy our time in enjoyable and entertaining (again, there’s that word) ways. The daily prompts will be inspired by the the summer-laced titles of the aforementioned movies, films, programs, songs, books and anything else that will inspire us this summer. Wednesday will include a form requirement and Sunday will be treated like the other 26 days with a prompt in keeping with our theme! There may be a couple “wild-cards” thrown into the mix, just to keep you on your poetic toes. So join us, won’t you? And invite your poetic friends to do so as well! 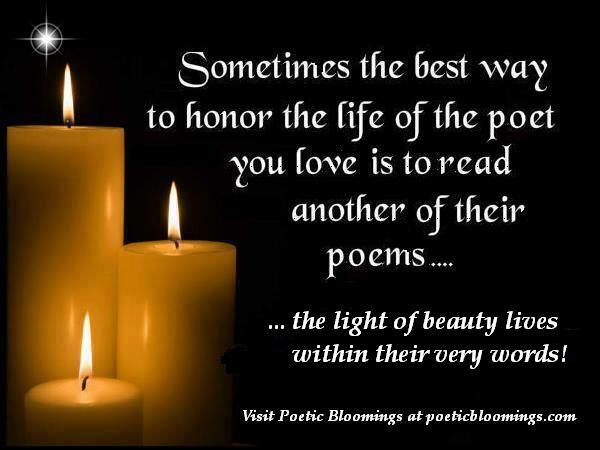 These have always been favorite undertakings here at POETIC BLOOMINGS. And the payoff at the end is your compiling (and us highlighting) your “Entertaining Summer” Chapbook. At the very least, you’ll have a whole month’s worth of poems to fudge and whip into shape for your portfolio! Sara and I hope to see you here! We had gotten a great response to our call for Mother’s Day tributes. And it was an unofficial start to our “planting” season. Today we begin in earnest with our first form exploration of the re-boot. Today we fete: the Boketto! A while back, our friend Meena Rose wrote about the idea of boketto. Boketto is a Japanese word that really doesn’t translate into English very well. The concept of Boketto is akin to staring at the sky or into the distance without a thought… Getting lost in one’s own self; removing the self from a place mentally. There is no regard to the past and no connection to the future. There is only THIS moment. A variation of the Boketto makes use of two (three) ancient Japanese forms, the Tanka and the Haiku (Senryu). The moment of which you write will determine the choice. (Haiku – nature; Senryu – everything else). **I was sitting in my “writing corner” of the living room, dogs asleep in a stream of sunlight. Prevalent sound was the ticking of the clock, and the sense of my thoughts whirling. hoping to find inner peace. **WHITE NOISE was a restless night with the television on. I’m not sure if the TV kept me awake or if I hoped it would soothe. It did not. lost in this moment in time. and become one with my words. **SOLACE IN SELF was a bout of writer’s block that plagued. The silence of this night filled my head with words. I thought I was a die-hard New Yorker, yet here I am residing in the Pacific Northwest for over seven years with my husband, John, and our two dogs, Marion Miller and Murphy. A tug of war does exist within me, because I miss family and friends. However, joining a poetry group out here was a wonderful move for me. Voices in Verse meets once a month to share poems or simply listen to readings. With encouragement from Robert Lee Brewer of Poetics Aside, and his followers, I finally set up a blog called Purple Pen In Portland. Yes, as some of you already know, purple is my favorite color, and I write in purple ink before typing. Sometimes I reside in Alice’s Wonderland, which takes me out of myself with the help of charismatic characters. A vivid imagination makes that a seamless move. My office is filled with Wonderland prints, and a hanging teacup. Being an addictive poetry site person, you may find my scribblings at Poetics Aside, Poets United, Imaginary Gardens With Real Toads, The Sunday Whirl, Magpie Tales, Margo Roby’s Wordgathering, dVerse Poets Pub, and my favorite haiku site – Chevrefeuille’s Carpe Diem. (links to all can be found in the “Other Poetry Places” tab) I relish poetic prompts and form challenges, though I generally write in free verse. Fibonacci, shadorma, triolet, and haiku are some of my favorites. My work has been seen in these publications: The Avocet, Still Crazy, Writer’s Digest Competition Collection, Poetsespresso and let’s not forget the anthology, POETIC BLOOMINGS: The First Year. It is a great honor to be working with Walt Wojtanik, whose poetry I have admired for many years. POETIC BLOOMINGS was always my favorite family, and I am thrilled that it is reuniting and I can play a part in that rebirth.